Set your table with Elegance!! Enjoy our new line of premium designed plastic octagon plates with a lace border. 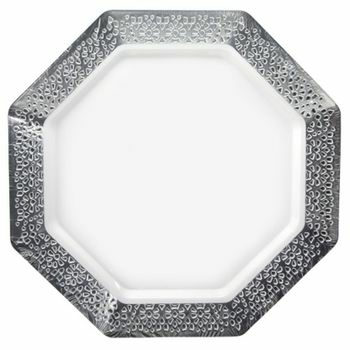 This unique pearl colored plate with silver lace border is great to use at any formal function. Available in 11", 9", 7" and bowls as well. Lacetagon 11" Pearl w/ Silver Lace Border Octagon Banquet Plastic Plates 10ct. Lacetagon 9.25" Pearl w/Silver Lace Border Octagon Luncheon Plastic Plates 10ct. Lacetagon 7.25" Pearl w/Silver Lace Border Octagon Salad/Dessert Plastic Plates 10ct. Lacetagon 14oz. Pearl w/Silver Lace Border Octagon Soup Bowls 10ct. Lacetagon 5oz. Pearl w/Silver Lace Border Octagon Dessert Bowls 10ct.